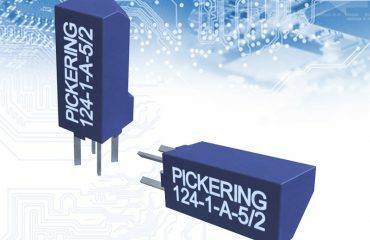 Pickering Electronics have expanded their high voltage Single-in-line (SIL) Reed Relay range to include three new series, that all offer higher packing density. The Series 67 and 68 dry Reed Relay range for up to 10kV, and the Series 119 Micro-SIL range for up to 3kV. The recently released Series 67 and 68 Reed Relay range are available for up to 10kV stand-off, 7.5kV switching, with an option of either PCB or flying lead switch connections. Similar in specification to the long established Series 60/65, these new relays are manufactured in a SIL format using former-less coils which dispense with the more usual coil supporting bobbin allowing a smaller package than similar rated devices. The unusual package design does present some interesting packing possibilities for high density applications such as multiplexers and matrices in instrumentation and test systems. 5, 12 and 24 volt coils are available as standard, and other voltages can be supplied to special order, as can variations in the lead length of the Series 68 range. The relays are suitable for high voltage transformer and cable test and some electro-medical applications such as defibrillators. The new Series 119 is the industry’s smallest high voltage SIL Reed Relay for up to 3kV stand-off. 1 Form A, 2 Form A and 1 Form B versions are available with either 3, 5 or 12 volt operating coils. The 1 Form A, 1kV version has 4 pins on 0.15 inches (3.8mm) pitch, the same as the long established Series 109P. These can be stacked side-by-side for maximum packing density (all Pickering SIL Relays have full magnetic screening allowing side by side operation). This new relay is intended for voltages considerably higher than standard small SIL relays, ideal for Cable and Backplane Testers and Mixed signal ATE. Pickering also offer other Single-in-Line High Voltage dry Reed Relays with the Series 104 for use up to 3kV stand-off, 25 Watts switching. The long established Series 60, 62, 63 and 65 are suitable for up to 15kV stand-off, 12.5kV switching at 50 Watts maximum. The Series 62 and 63 also come with push on connections on the top face. Like the new Series 67 and 68, these larger parts all feature robust tungsten plated contacts to ensure a long and reliable life. 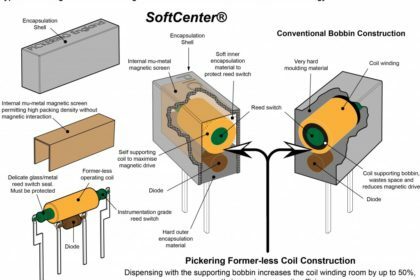 All Pickering Reed Relays are constructed using SoftCenter® technology, which uses a soft inner material to reduce stresses on the reed switch. In addition, contact life and more reliable contact resistance are achieved by our use of Former-less coil winding. 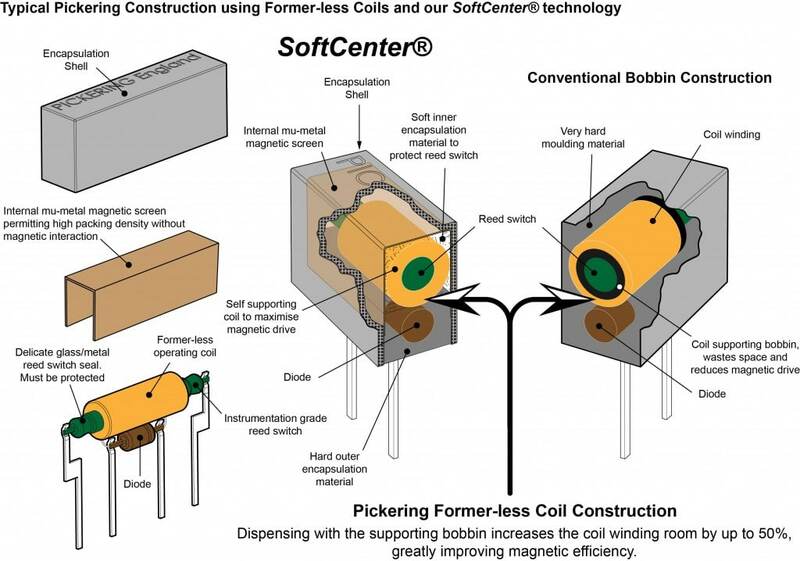 Former-less coils are manufactured using a fully automated process that provides consistent output quality and repeatability. A much higher magnetic drive level and better magnetic coupling as the smaller diameter of the inner turns are more efficient (more turns per Ohm). 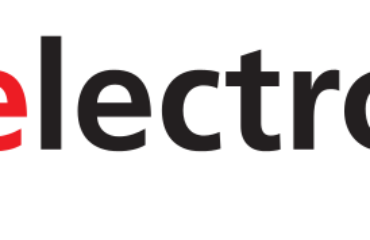 The number of Ampere Turns (AT) is increased – Reed switches are usually rated in sensitivity by an Ampere Turn number, for example, an AT rating of 15AT is twice as sensitive as one with a 30AT. Because the 30AT switch needs more magnetic drive there is much more ‘restoring force’, which is the ability to open when the coil drive is turned off. This in turn extends the working life of the reed switch many times.